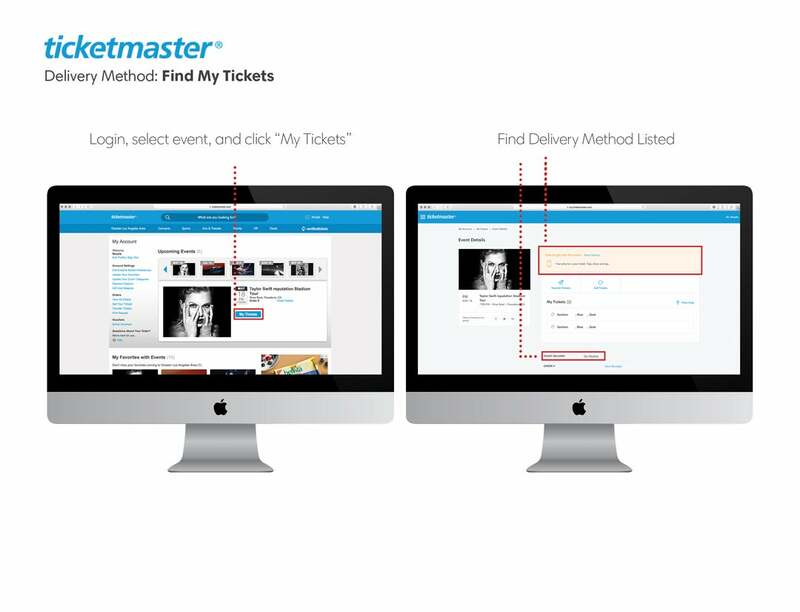 With so many options to get in to your next event, Ticketmaster makes it easy for you to find and manage all your tickets in one place. Depending on the event and the ticket delivery selected at checkout, there may be a few options to access your tickets. To get started, you'll want to visit My Account and locate your order to see which delivery option was chosen. Need a tip for what to look for? Click here for a quick example. Below, we've included a guide with more information and some tips when heading out to your next event. If you don't see the order you're looking for, you may have used a different account to purchase tickets. You'll need to login to that Ticketmaster account to access your tickets. Electronic Tickets - This may also show as eTickets An electronic ticket (eTicket) can be a Mobile Entry, Print-at-Home, or Credit Card Entry ticket (Paperless). Your tickets will be located in your account and will be available for you before the event. Visit My Account to locate your Electronic/eTicket type. Mobile Entry (Go Mobile) Mobile Entry is the easiest and safest way to access tickets to your events. When your event is Mobile only, or you selected Mobile Entry at checkout - your mobile phone is your ticket. Your tickets will not be available for print or emailed to you. Pro tip: have a fully charged battery before you head out to your event. Please note: Mobile Entry is not available for all events. Please refer to your ticket order in your account. 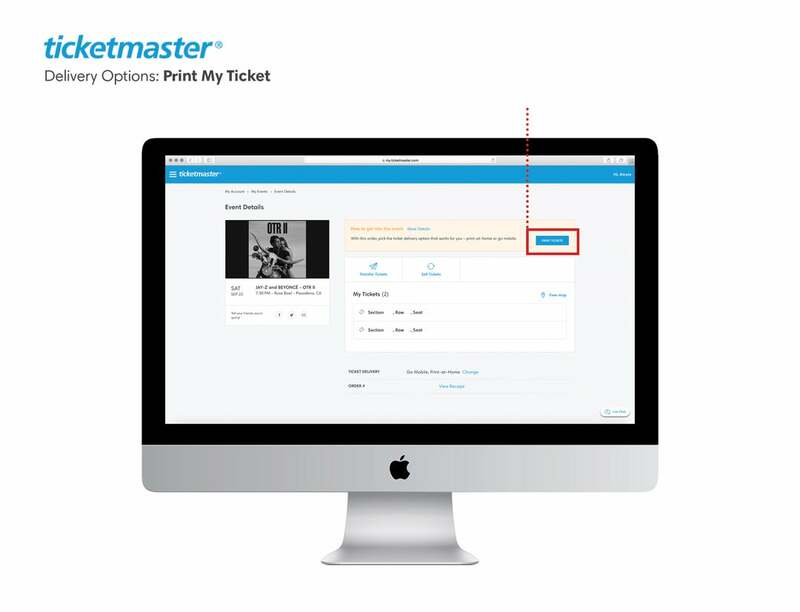 Print-at-Home To print your tickets, use the browser on your desktop, laptop or mobile device and login to your Ticketmaster account. Then, locate the order for your event and print your tickets. Please note: tickets may not be printed from our app. For online orders: When your tickets are ready to print, click the "View Tickets" button on the Order Detail page of your account. See an example here. For orders placed over the phone: Your tickets will be sent to the email used at the time of purchase as a PDF attachment. When you select to Print-at-Home, make sure you have your tickets handy before you head out to your next event. Credit Card Entry Your credit card is your ticket. Bring the same card used for purchase and your photo ID. They'll simply swipe your card at the door to get you in. These tickets are non-transferable and everyone in your group must enter together. When using Credit Card Entry, your tickets will not be emailed to you and will not be available for print. Please note: the credit card used for entry MUST be the same one used to purchase your tickets. Standard Post Get your tickets within 10-14 days of the event date. Please note, this delivery may take longer if there is a delivery delay on your event. If you haven't received your tickets two days (48 hours) before your event, please Contact Fan Support. Box Office Collection Tickets held at the box office can only be retrieved by the cardholder with the original credit card of purchase and a valid photo ID. DHL Get your tickets delivered via DHL. Please note, delivery to PO Box or APO/FPO addresses is not available at this time. When you use DHL delivery, your tickets will not be emailed to you. Delivery Delay Some performers, teams, and venues release their tickets with a delivery delay. A delivery delay is used to prevent tickets from being accessed until we can confirm everyone has adhered to the event ticket limit and didn't use unfair ticket technology to buy in bulk. In other words, we want to make sure no one has ordered more than their fair share of tickets and the process is fair. Delivery information is provided within your purchase confirmation email, on your order in My Account, or on the event page. If you haven't received your tickets two days (48 hours) before the event, please Contact Fan Support so we may assist.